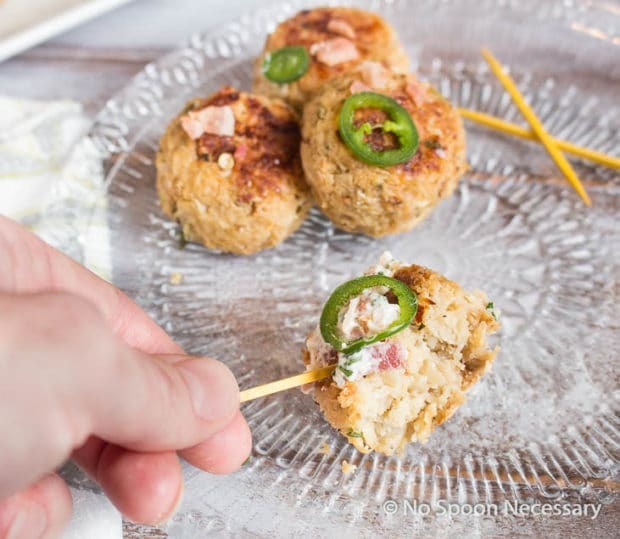 These vegetarian, tender, golden brown and delicious Baked Jalapeno Cauliflower Meatballs prove you don’t need meat for meatballs! 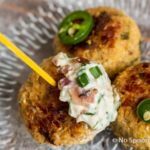 Served with a creamy bacon and chive sauce, these Cauliflower Meatballs are perfect as a snack, appetizer or even a main dish! It is no secret around my house that I am a lover of all things cauliflower. I pretty much always have a head of it in my refrigerator. Unless, for some reason unbeknownst to me, the produce section at my market failed to provide an unblemished selection of my favorite head of florets. Cauliflower rice, cauliflower couscous, cauliflower cream sauce, cauliflower mash, buffalo cauliflower bites, ranch roasted cauliflower florets, a whole head of cauliflower roasted with cumin spices…. I love it all. And I can’t get enough. If you follow my blog, or know me personally, you also know I am a dipping sauce addict. I have a somewhat shameful plethora of condiments, just waiting to be combined, spun and whipped together, into a variety of sauces for dipping. I would post a picture of my pantry, if fear of being ridiculed didn’t deter me from this action. B) If I am not crazy, I must be preparing supplies for a bomb fallout shelter. Well, I am neither A) nor B). I just like condiments… so what?! This love simply means, I’m prepared for the unknown. Boy comes home and decides he would like sliders for dinner? Hold on while I whip up a BBQ-Bourbon concoction to slather on that beef. Oh, it is Taquitos my honey-bunny is craving?? Give me two seconds, so I can buzz together an avocado-ranch inspired dip to go along with those. Grilled Rib eye is your desire, my dear??? Hit pause while I process some chimichurri together for you. I am not ashamed of you, my beloved condiments. You and I belong together, like two peas in one pod. I’d even spell my love for you out in the sky. ‘Chey hearts Dipping Sauces 4-eva & eva’. Anyways, this dish I’m bringing to you today, it was inspired by my love of both cauliflower and sauce. 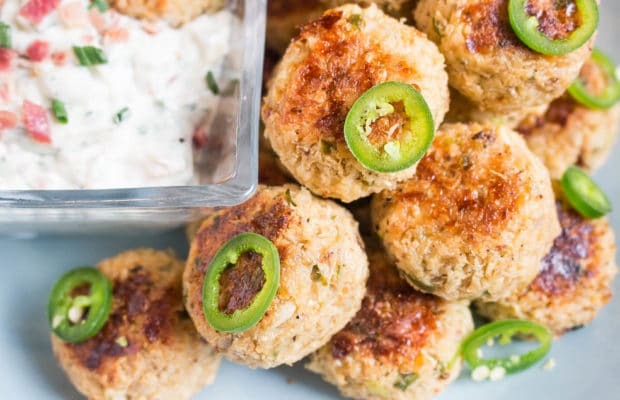 The idea for these meatless balls and dipping sauce came about when I was staring into my fridge the other day, ogling the head of cauliflower… racking my brain. Trying to strum up some new culinary magic to perform on my favorite vegetable star. My normal go-to’s just weren’t doing it for me that day… they all lost their appeal. So I shut the refrigerator door and went about my business working on some seriously boring, but necessary, NSN I.T. SEO stuff. Inspiration struck, like it normally does, out of sheer boredom, and when least expected. I knew I had jalapenos (another staple of mine) in the crisper drawer. I was pretty sure that there was still some cooked bacon (Boy’s staple) on a shelf, that he had shockingly not devoured yet. Something snacky and bite sized sounded good. Oh, oh and I simply must have this with a sauce of some sorts…..
Badda-bing, badda-boom! 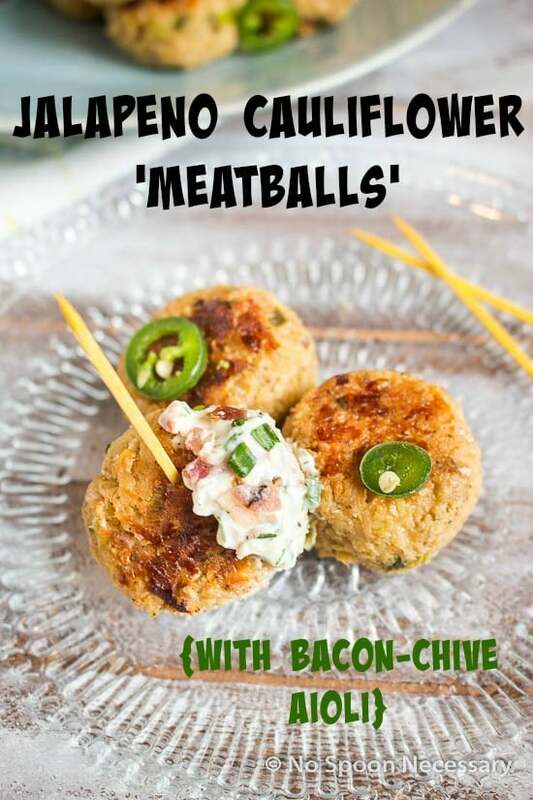 Enter, Jalapeno Cauliflower ‘Meat’Balls with Bacon-Chive Aioli. I wanted the vegetarian meatballs to be meatball like. Crazy, I know. Also, I wanted them to have texture, I wanted them to have a crispy brown exterior, and absolutely did NOT want them to be a ball of mush. I happened to get really lucky on these meatless balls. I thought it might take me a few different courses of action, and attempts, to come up with a cauliflower ball that actually held together, with my ambitious goals for overall taste, and without much extra binding. This is where I decided to mix my methods for cauliflower mock mashed potatoes and cauliflower rice together. I wish I was this smart more often. 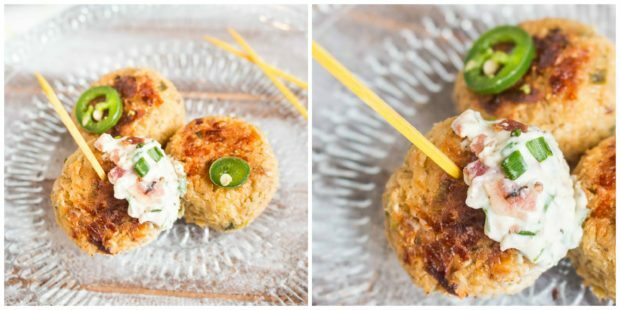 Because what I produced here, with these cauliflower meatless balls… sheer, unadulterated genius. 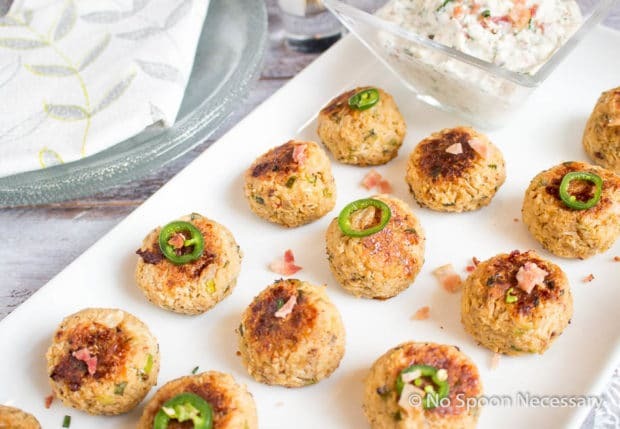 On to the dipping sauce, I wanted to keep the cauliflower meatless balls, well… meatless. I love my vegetarians. I did use to be one. But, I also (now) love my bacon. So I decided to keep ‘em separate. Turns out that was pretty darn genius too, because the bacon-chive aioli is going to rock your world. You need to get on this. Roast some cauliflower, roll and form some balls, cook ‘em off, whip together some aioli and prepare yourself for the best thing to happen to you, culinary wise, in a very long time. And if you have a little one who you are trying to get to eat more vegetables, you don’t need to look any further. So scroll down a little, print this out, and get to work… then come back and leave me a comment 🙂 Cheers! 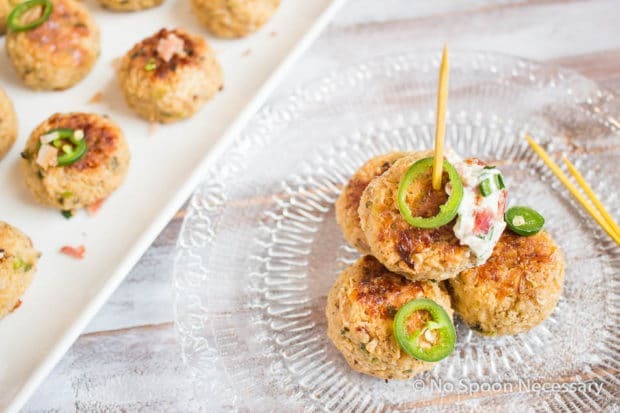 These vegetarian, tender, golden brown and delicious Baked Jalapeno Cauliflower Meatballs prove you don't need meat for meatballs! 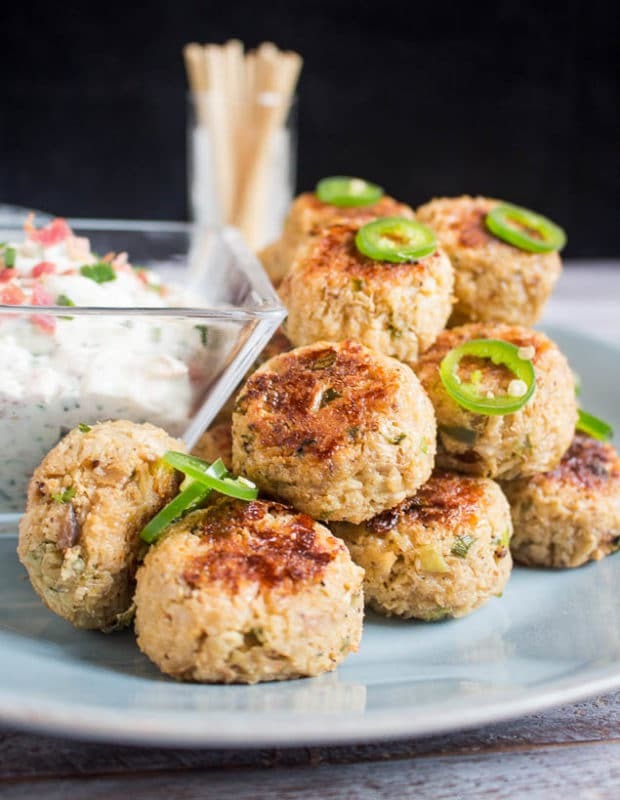 Served with a creamy bacon and chive sauce, these Cauliflower Meatballs are perfect as a snack, appetizer or even a main dish! Preheat oven to 425 degrees F. Prepare a large baking sheet with aluminum foil and spray with PAM or wipe generously with olive oil to prevent cauliflower from sticking. In the bowl of a food processor, pulse the Romano cheese until it is coarsely grated. Transfer to a large mixing bowl and set aside. Place florets in a single layer on prepared baking sheet, taking care to space them and not over crowd the sheet pan. Drizzle tops of cauliflower with additional olive oil or spray with PAM. Season generously with salt and pepper. Roast for 25-30 minutes, flipping over half way through cooking time, until cauliflower is golden and cooked through. While cauliflower is baking, heat a non-stick sauté pan over medium heat. Add Extra Virgin Olive Oil. Add Onion and Jalapeno. Season with salt and pepper. Sauté for 5-7 minutes, or until softened. Add Garlic and sauté 30 seconds- 1 minute, until fragrant. Remove from heat and add mixture to the bowl of a food processor. Reduce oven temperature to 415 degrees F.
Pulse cauliflower and onion mixture for about 1 minute (roughly 15-20 times), until it resembles rice consistency. Remove 1 CUP of the pulsed cauliflower mixture and set aside. Transfer remaining cauliflower mixture to the large mixing bowl containing the grated mozzarella cheese. Transfer cauliflower puree to mixing bowl. Add beaten egg, panko, potato starch, Romano, parsley, green onion, crushed red pepper flakes, salt and pepper to bowl. Spray your hands with PAM. Form golf ball sized (about 2 Tablespoons) cauliflower balls, squeezing it together in your hands to make sure it is compact. Place formed cauliflower ‘meatballs’ on prepared baking sheet. Spray tops of ‘meatballs’ with PAM. Bake for 20-25 minutes, flipping half way through baking time. Remove from oven. 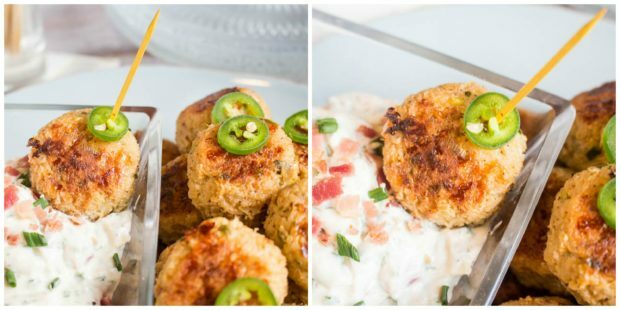 Serve with Bacon Aioli and enjoy! Combine mayonnaise, sour cream, 2 TBS of chives, bacon drippings, garlic, lemon juice, salt and pepper in the bowl of a food processor. Transfer to a small mixing (or serving bowl). Fold in the remaining 1 TBS of chives and the chopped bacon. Taste and adjust seasoning. Set aside in the refrigerator until ready to use. 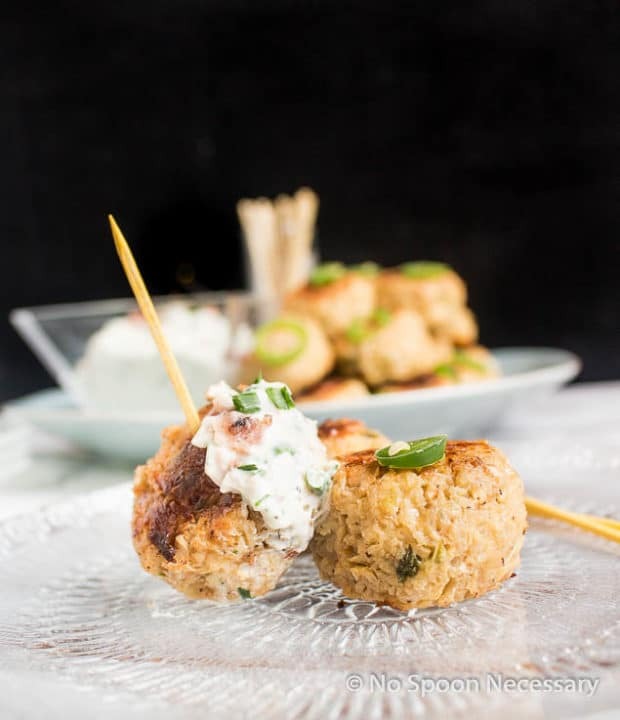 *To Make ahead: Prepare meatballs through steps 16 or 17 (mixing or forming the cauliflower meatballs), placed on a sprayed plate, cover and refrigerated up to a day in advance. You may need to add a few minutes to your bake time. *To reheat any leftover cauliflower balls: Heat in a 350 degree oven for 5 minutes, flip over and continue baking for 5 additional minutes. *Nutritional Information does not include Aioli! 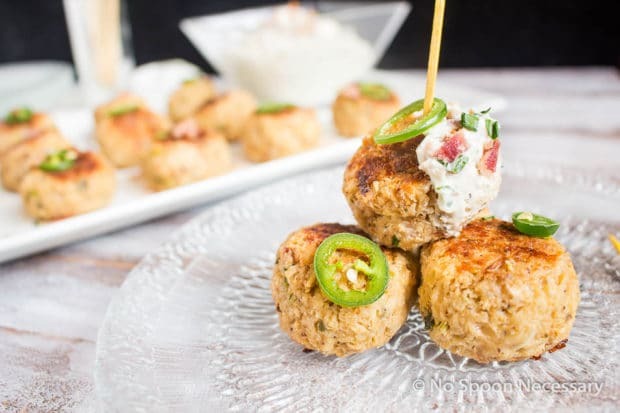 Awesome looking cauliflower meatballs and as a omnivore I’d like to thank you for including bacon 🙂 Great website and thanks for sharing the recipe. Cheers! Trevor (Burger Nerd) – Thank you for stopping by and the kind words! It’s my pleasure to include bacon, for your devouring pleasure, in the aioli! 🙂 Cheers right back at ya!